BLACK N GOLD HOCKEY PODCAST | A website dedicated to bring you the most accurate news and information about the Boston Bruins organization from a fans perspective. This site is not affiliated with the NHL club in any way. When a Boston-Toronto matchup comes to fruition in the playoffs, it is sure to be a battle — the last two, and now three playoff matchups between the two teams are indicative of that. For the third time in the past six seasons, the Bruins came out victorious in seven games over the Maple Leafs. It wasn’t a squeaky clean series from the Bruins, but they found a way to get it done in the end. Sure, the reasons I state aren’t the only reasons the Bruins prevailed, but they are important ones. The acquisitions of Charlie Coyle and Marcus Johansson were orchestrated by Don Sweeney at deadline time. Coyle didn’t light up the score sheet as a Bruin post-trade deadline, but really helped a third line that saw ebbs and flows throughout the season. Coyle broke out in the first round, big time. With three goals and an assist, his four points were good for fifth on the team in scoring. The stability of his presence on the third line never faded, and his ability to score and push the pace in all three zones really came through and was paramount in the team’s success. His empty netter last night sealed the deal on the series, but his lone assist of the series in the team’s game four wins was a huge one. Coyle’s importance can’t be overstated. Despite only playing in five of the seven games, Marcus Johansson made an impact as well. Overall, he had a solid series, but he really came through last night with a huge goal to give the Bruins a two-goal lead. Not to mention a big blocked shot late in the second period of an eventual game four win — the Bruins were up by two goals at the time. Marcus Johansson scores off the assist from Jake Gardiner. Overall this season, the fourth line has seen its share of ebbs and flows, like the third line. They really got a boost when known buzzsaw Sean Kuraly returned from injury in game five. At times, the fourth line looked pretty rough, but they saw a resurgence when Kuraly’s presence and high-energy style was at its peak. The bottom line’s most notable performance, with Nordstrom, Kuraly, and Acciari making up the line, came in game seven. In combining for two goals and three assists in the game, the fourth line pushed the pace and put the Bruins over the top to win when it all came down to it. Big-time players make big-time plays. Tuukka Rask was phenomenal in the first round, and has been for much of the season as a whole. He wasn’t perfect, but he made crucial saves when they were needed most in the end. After the game last night, Rask hinted at being his changed workload in the regular season helping, and he sure gave us a glimpse. Credit can certainly be given to the Bruins’ coaching staff and Jaroslav Halak for this, additionally. Rask finished this series with a 4-3 record, 2.31 GAA, and a .928 save percentage. Here’s arguably the best save he made, if you somehow haven’t seen it already. A first playoff rodeo didn’t intimidate Brandon Carlo. Injuries in year’s past robbed him at a chance to show what he could do in the playoffs — this year, he got his shot. In doing so, Carlo gave anyone watching a real glimpse of how much of a legitimate shutdown defenseman and leader he can be. Everything viewers could have expected and then some. He was the team’s best defenseman and got the recognition he deserved from media. Have a gander at this short thread for some more perspective, in a game six sample size. "Corsi against" (CA) tracks the total shots against while a player was on-ice (on goal + blocked + missed). For the first five games of the series, Carlo averaged 29.4 CA, bottoming-out with 37 in Game 3. Last night, he recorded 15 CA. Individual performances obviously shined through, but so did the resilience of this Bruins team as a whole. They had their backs against the wall after a game five loss with a game six in a hostile Toronto environment on the docket. They battled to win an extremely stressful game six, get back to home ice, and clinch the series on home ice. Game six saw the Bruins down a goal in the first thanks to Morgan Reilly, but they battled back to eventually win 4-2. Scoring the first goal can often be crippling, especially in a must-win game — not this time. Speaking of scoring the first goal, Nordstrom helped in that regard last night and the Bruins didn’t fall behind once, despite a dominant second period from Toronto. That resilience that was so huge in their success was huge in the end. Also, I feel obligated to mention the fact that the camaraderie between Boston sports teams is something special. Most recently with Julian Edelman going crazy at the Garden last night, we also saw members of the Boston Celtics, coach Brad Stevens, and prominent Patriots players like Rob Gronkowski, Tom Brady, and James White, amongst others showing their support. All of this that we have seen recently, as well as over the years is too cool not to mention, and the players do appreciate it. As I said, the importance of the Bruins’ stars and other players who didn’t get a mention in this discussion, obviously contributed to the team’s success as well. The lack of a mention isn’t meant to discredit them. But, these were the factors that stuck out to me the most. It was an epic series, and now the Bruins are on to Columbus. While the beleaguered “beLEAFers” belabor their Bieber, the Bruins and Boston are basking in Rask who was up to the masked task in a riveting Game 7 at TD Garden. And for what feels like the first time (dare I say, only a Foreigner of hockey would not know this), the praise is finally universal for “Tuukks.” Here’s a collection of commentary backing up the B’s backstop who, with his team’s back against the wall, led them into the second round of the Stanley Cup Playoffs! 🗞️STANLEY CUP PLAYOFFS🗞️#NHLBruins G Tuukka Rask Silences Critics Again With Clutch Game 7 Win Over #LeafsForever But How Long He Ever Get The Respect He Deserves? Great Bruins win last night & for anyone who knows knows I’m not a huge Rask fan BUT last night he STOLE that game imo. I’ve got 2 other observations about that series but I’m keeping those close to the vest out of respect. So, what comes next in net for the fortuitous Fin whose fighting finish finally finished the loser Leafs? Obviously, it’s Columbus. And then perhaps the Islanders. Then maybe the Sharks. Then hopefully THE CUP! I can guarantee one thing… if –actually WHEN– that happens, Tuukka Rask will never have to worry about criticism or praise again. He’ll truly be able to bask in it all…just like we should be doing right now! Tell me if you’ve heard this one before. The Boston Bruins defeated the Toronto Maple Leafs in seven games to win their Stanley Cup Eastern Conference opening round series. That’s right, for the third time in six seasons, the Bruins have advanced in a do-or-die, series decider on Garden ice over the Toronto Maple Leafs. When all was said and done there were a number of deciding factors but the difference in this series came down to the performance of special teams. The Bruins out-performed Toronto on both the power play and the penalty kill, combined with the boost to their bottom 6 provided by the return of Sean Kuraly for the final three games of the series, and there was just enough for Boston to separate in a tight series and punch their ticket to the second round. 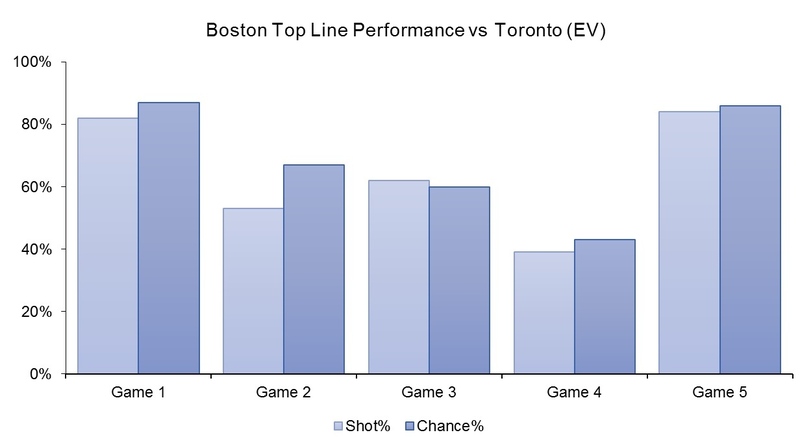 Boston’s special teams outplayed Toronto’s all series long. 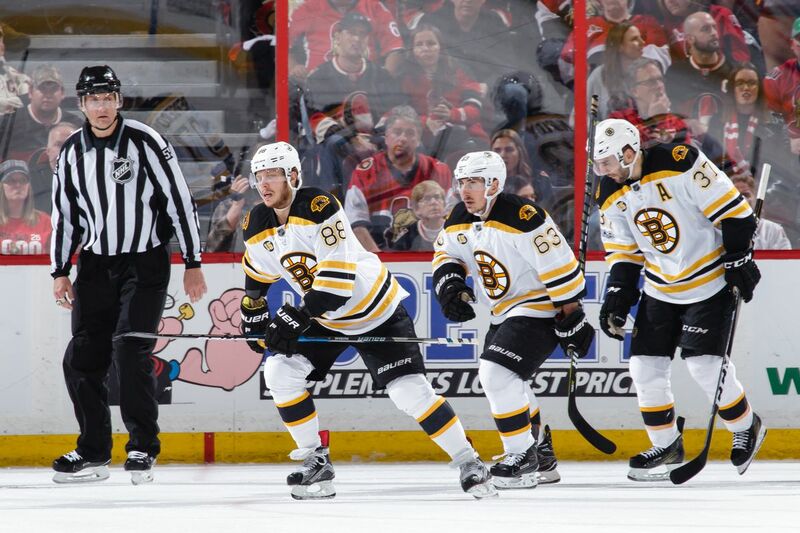 The Bruins scored seven power play goals in 16 opportunities for a 43.8% clip. Toronto, meanwhile, scored just three power play goals in 16 opportunities, good for just an 18.8% success rate. Toronto also added a short-handed, penalty shot goal by Mitch Marner in the opening game. The importance of the power play in a tight, relatively low-scoring series is illustrated by considering the impact that special teams had in deciding a number of the games played in this series. Special teams were the difference in each of the last five games played. In Game 3, Toronto outscored the Bruins 2-1 on the power play in a game that ended 3-2 in their favor. In Game 4, Boston outscored Toronto 2-1 in a 6-4 victory. In Game 5, Boston’s power play went 0 for 3 in a low scoring affair in which capitalizing on any of their opportunities may have changed the flow and outcome of that game. The Maple Leafs won 2-1. 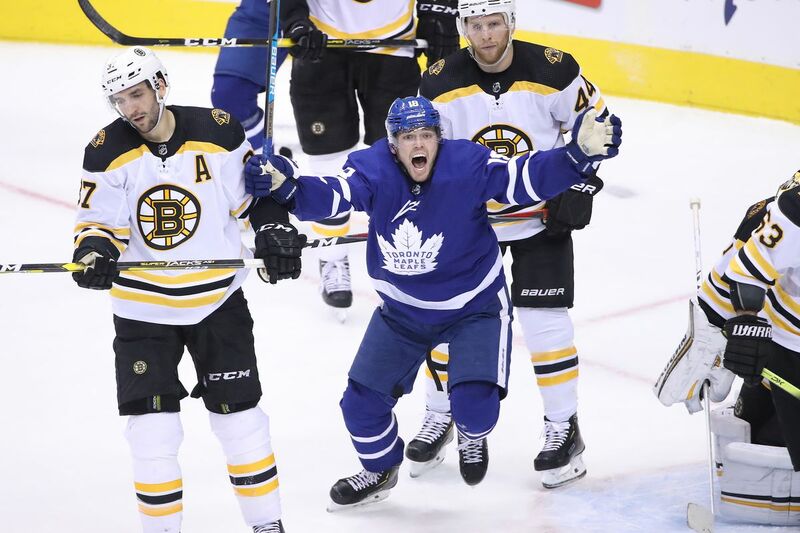 In Game 6, the Bruins went 2 for 2 while the Maple Leafs went 0 for 3 and the Bruins prevailed 4-2 to stave off elimination and force Game 7. In Game 7, the Bruins were not given any power play opportunities but they did kill both of the power plays the Maple Leafs had, including one in the second period with the Leafs pressing in a one-goal game. They also killed off a too-many-men on the ice call midway through the third period that could have allowed Toronto to pull within a goal. The Bruins’ power play potted a pair of big first-period goals to start Game 6. The expectation going into Game 7 was that there wouldn’t be many power play opportunities. Given what was at stake, we expected to see disciplined play from both teams in the finale. There is, after all, no margin for error in a win-and-move-on, lose-and-go-home decider. That was exactly how it played out. The referees ‘let them play’ and in the end there were only two minor penalties called, both against Boston. The Bruins came up big on the penalty kill and were able to leverage that into the series clinching victory. Both the Maple Leafs and Bruins struggled to carry the momentum of a victory from one game to the next in this series. The Bruins were finally able to buck that trend and grab the necessary consecutive wins in games 6 and 7 to capture the series. Boston clearly established a special teams advantage and at the end of the day in a seven-game series that went right down to the wire, yet again, it was superior special teams play that propelled the Bruins into an Eastern Conference Semi-Final match-up with the Columbus Blue Jackets. The Boston Bruins recently announced a 10 year extension with their AHL affiliate, the Providence Bruins. It was a record agreement and a tribute to the successful partnership between the two teams, which Bruins president, Cam Neely, cited as a major factor in securing a long-term deal. With the AHL affiliation tied down until 2029, the B’s have yet to make a decision, at least publicly, on the agreement with current ECHL affiliate, the Atlanta Gladiators, which ends this season. The Gladiators became the ECHL affiliate of both the Boston Bruins and the Providence Bruins after signing a two-year agreement in 2015. In February of 2017, the agreement was extended a further two years, securing the affiliation until the end of the current season. With the announcement of the 10 year extension with Providence back in March, many expected the B’s to follow-up with news on their relationship with Atlanta, but we are still waiting. With the Bruins focused on the Stanley Cup playoffs, an announcement on the future of the ECHL affiliation is unlikely until the team is finished on the ice. Boston has a number of options, the most obvious would be to extend the affiliation with Atlanta. The Bruins have a number of goaltenders in their prospect pool and the ECHL is a great place for them to hone their skills. Providence goaltender Dan Vladar featured regularly for Atlanta in the 2017-18 campaign and with Kyle Keyser eligible for the pros next season, Atlanta would be an ideal spot for him to continue his development. Throughout the regular season, as players were summoned from Providence to Boston, Atlanta reinforced Providence with the likes of Tanner Pond and Sean Bonar, while giving regular playing time to Olivier Galipeau, Joel Messner and Brett McKenzie. The fundamental role of a minor-pro affiliate is to support the senior teams, Atlanta has certainly fulfilled that role for the Bruins. Big game seven tonight for our @NHL affiliate! It is possible that the Bruins part ways with Atlanta. If they do, there are currently two independent ECHL teams that they could partner with, the Greenville Swamp Rabbits or the Rapid City Rush. Geographically this would not make much sense, as neither team is close to New England. Unless the B’s plan on bringing the affiliation closer to home, it would be a shame to sever ties with Atlanta after building a close relationship with them, only to start over with another team based so far away. It was reported earlier in the season that the Manchester Monarchs are seeking new ownership, casting doubt on their future. This creates a potential opportunity for the Bruins to step in and replace the LA Kings as the senior affiliate. It would make sense to have an affiliate closer to both Boston and Providence to reduce travel between the teams, making it easier for players to move up and down and allowing the organization to keep a closer eye on prospects. Perhaps a relationship with the Bruins would help the Monarchs, who have seen their attendance decline since they were switched to the ECHL. This is of course speculation, for now the Monarchs are still affiliated with the LA Kings, though things could change quickly with new ownership. Manchester Monarchs are for sale, have hired Sports Advisory Group to market for a new buyer, same outfit that found the four-person, current ownership team that took over in 2016. City, business leaders optimistic team will remain under new management. If the Bruins were to end the affiliation with Atlanta, expect the Glads to strike a deal with the Nashville Predators organisation. The Gladiators have worked closely with the Nashville’s AHL affiliate, the Milwaukee Admirals this season. Atlanta coach, Jeff Pyle, likes to push his players towards the higher levels and a relationship with a senior team makes that possible. Atlanta would most likely become Nashville’s ECHL affiliate if Boston were to move on. The Gladiators have certainly lived up to their side of the bargain, what Boston decides to do remains to be seen. For now we can only speculate on the future of their ECHL affiliation. For the third time in seven seasons, the Bruins and Toronto Maple Leafs will be facing off in a seven game playoff series. The Bruins made a legendary comeback to win in 2013, and won again in 2018. Should the following players keep their heads in the game and perform to their capabilities, there is no reason the Bruins can’t advance to the second round again. Always a controversial topic among Bruins fans, Rask has had a whirlwind season. Things started off ugly with a blowout loss to the Washington Capitals, then there was a short leave of absence, followed by some streaky play. All in all, the Finnish goaltender has been solid, but not world class, this season, putting up a 2.48 goals against average, and a save percentage of .912. He was very good in game 5, but the rest of the team wasn’t, so the Leafs were able to take the series lead. His performance on Easter Sunday was masterful, and the Bruins went on to force game 7 by nothing a 4-2 win. The Bruins will need another great performance out of Rask, as nothing takes the wind out of their sails like a bad goal can. Obviously the team defense has allowed Rask to be tested far more than he should be, but the Finnish netminder is going to have to overcome his skaters’ shortcomings if the Bruins are going to advance to the Conference Semifinals. It’s certainly not encouraging when the team is giving up breakaways to a star studded roster of forwards on the regular, but these goals need to be prevented nonetheless. However frustrating it may be, Rask has got to keep his head in the game, as he has for the last two games. Torey Krug is another player some Bruins fans love to hate. Sometimes their annoyance is understandable, especially during the last six games, as the puck has jumped over his stick at the blueline multiple times this series, causing a breakaway for the Leafs, or at the very least, squandering an offensive opportunity for the Bruins. Krug, however, is a double-edged sword: the Bruins employ a high-risk, high-reward strategy during the power play, and Krug is a vital piece when they’re on the man advantage. The Bruins also have trouble breaking out of their own zone cleanly when he’s not on the ice, so while he may leave something to be desired defensively, he is indispensable to this Bruins team. If the Black and Gold want to be successful in game 7, Torey Krug will have to keep his nerves in check, and will have to try and avoid the blue line mishaps that have been his calling card lately. At the very least, he’s going to have to do what he does best: make up for his defensive gaffes by scoring or setting up goals. His offensive talent is fantastic, and he’s going to have to bring it tonight for the Bruins to get the win. As Torey Krug’s defensive partner, Brandon Carlo will naturally be responsible for a lot defensively. No good offensive defenseman can do what he does without a good shutdown partner, and Carlo is exactly that. Brandon Carlo has played very well in this, his maiden playoff voyage, and he’s going to need to be aggressive and keep his head in the game tonight. Toronto’s top two forward lines are no joke, and they’ve been jumping on breakaway chances repeatedly during this series. Carlo is going to have to do his best to keep the door to the crease closed tonight. Having led the NHL in postseason scoring twice before, the Bruins’ second line center is known to have a lycanthropic streak, where he turns into am absolute beast once the postseason begins. Krejci Beast Mode is here again in 2019, and it needs to make its presence known in game 7. At this point, Krejci has scored 2 goals and assisted on two more in six playoff games. Four points doesn’t sound like much, but Krejci brings more than points to the table. He’s been playing the body all series, hitting anyone and everyone he can. The Czech center can also play well without the puck, so the Bruins are able to rely upon him a bit defensively, as well. Ideally, Krejci will be centering Jake DeBrusk and David Pastrnak tonight. The combination of Pastrnak’s speed and shot combined with DeBrusk’s straight-line speed and love for crashing the net match perfectly with Krejci’s bizarre ability to slow the game down and allow his teammates to get to where they need to be before making the magic happen. If Krejci continues to play like a man possessed and he’s skating with DeBrusk and Pastrnak, good things will happen for the Bruins’ offense. Like they say, as David Krejci goes, so go the Bruins. Jake DeBrusk is all heart, and is exactly the kind of player you want on your roster for games like this. He emits this “young Mark Recchi” aura, and it is wonderful. His going head-to-head with Nazem Kadri and causing him to be suspended for most of the series was entertaining, and actually pretty important. DeBrusk has only scored one goal and assisted on another in the six games he’s played in this series, though, and that will have to change if they’re going to make a run of this. Playing alongside the Czech Davids is both a gift and a responsibility. DeBrusk has earned his ice time for sure, but he’s going to have to produce if he wants to keep it. DeBrusk will need to do what he’s best at – winning puck battles and crashing the net. If he continues to move his feet and fight for his ice like he did against Kadri, the goals will come. In the first six games of this series, David Pastrnak has scored two goals, and has notched four assists. He hasn’t looked like his usual self through much of it, though — he’s tried to get cute and make the extra pass instead of shooting a few too many times this series — Pastrnak will need to get away from that and play his usual game. Pasta cannot let Toronto’s defense out-muscle him and force him to the boards. He will need to fight for the middle of the ice and put as much on net as possible. Krejci will undoubtedly be feeding him passes for one-timer opportunities, and DeBrusk will be in the crease to hit any rebounds home. If Pastrnak is able to put up with Toronto’s physical game and get as many pucks on net as possible, it should pay off. Bergeron is the heart and soul of this Bruins team. He is far and away Boston’s best player. Bergeron is a gamer and will likely have a big game 7, as he typically does, and the Bruins need it, badly. Bergeron is their go-to when it comes to must-win faceoffs, and his line is typically the one Bruins Head Coach Bruce Cassidy turns to when a big goal is needed. It is rare that Bergeron has consecutive bad or no-show games, but he has looked a little bit off this series. Bergeron being engaged, healthy, and allowed to take important faceoffs (instead of being kicked out, as NHL linesmen seem to love doing to Bergy) are paramount to this Bruins’ team success. If Bergeron can play his game and not be neutralized by the Leafs, the Bruins will have a much better chance at a successful game 7. He and Brad Marchand, like David Pastrnak, need to put pucks on net rather than making the extra pass. Andersen needs to see as much traffic and as many shots and possible if the Bruins want to win tonight. Pray to the Hockey Gods that Bergeron comes up big tonight. Bruce Cassidy announced at his pre-game press conference that Joakim Nordstrom and Karson Kuhlman would draw back into the lineup and Chris Wagner and David Backes would be the scratches. The first period started off much quicker and with more energy than Game 5 in Boston. The first penalty call was a controversial one as it initially appeared Zdeno Chara sent the puck out of play. 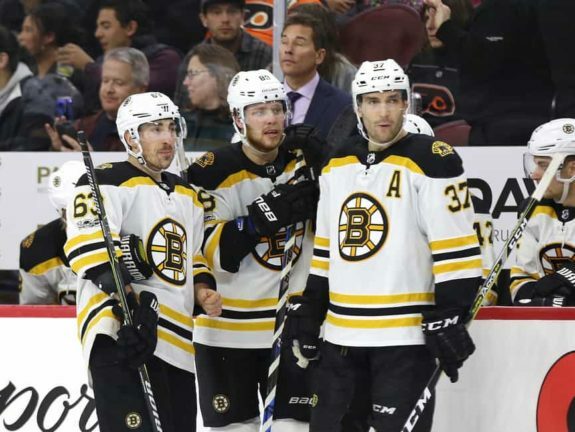 The on-ice referees conferenced and sent the Bruins captain to the penalty box but Marcus Johansson and Bruce Cassidy showed the referees the puck that had, in fact, landed in the Boston bench. Nonetheless, the Bruins went on the penalty kill and survived it. With 10:18 left in the first, the Bruins failed to get the puck out of the zone a number of times and Morgan Reilly rifled a shot from the point that beat Rask, giving the Maple Leafs a quick 1-0 lead. Right after Toronto struck first, Sean Kuraly drew a holding penalty and the Bruins had a chance to tie the game on their first powerplay of the game. Right off the face off to the right of Andersen and about halfway through the powerplay, Brad Marchand ripped a shot that deflected off a Toronto leg and through the five-hole of the Leafs netminder. The Bruins PP answer tied the game 1-1 — something the team failed to do three times in game five. After the Bruins tied the game, Joakim Nordstrom was battling Travis Dermott in the Leafs corner but was called for high-sticking (another controversial call after replays showed Dermott slew-footing Nordstrom). The Leafs would go on their second powerplay of the game and the period but the Bruins would again make the kill. Right after the successful PK, you guessed it, the Bruins went back to the powerplay when Dermott tripped Jake DeBrusk behind Frederick Andersen. The Bruins looked to take the lead in the game on their second PP of the period. After good zone time, David Pastrnak threw one off Andersen and Krug buried the rebound, giving the Bruins a 2-1 lead late in the first. The B’s looked to be playing some of their best hockey in the series at this point after giving up the first goal early. With just a minute left in the first, Andersen robbed Patrice Bergeron on the doorstep after Marchand wrapped the puck around the net. Bergeron did not get everything on the shot but Andersen nevertheless made the big glove stop. The Bruins came out strong in the second period and were the faster, more physical team in the beginning of the middle period. At 7:53 of the second, David Krejci and Jake DeBrusk brought the puck into the attacking zone and in a give and go play, Krejci found DeBrusk who deflected the pass past Andersen, extending the B’s lead with an insurance goal to make it 3-1. Right after the Bruins goal, yet another questionable call sent the B’s to the penalty kill when Charlie Coyle was whistled for tripping. However, like the previous two times, the Bruins made the kill and kept the lead by two. The Leafs responded (after coming up empty handed on the PP for the third time in a row) with a few strong shifts of their own. After getting some looks on Rask and a scramble in front, David Krejci gathered the puck and sent it down the ice for icing to alleviate some of the Toronto pressure. Auston Matthews won the ensuing draw and the Leafs hemmed the tired Bruins in their own zone. The puck was worked around to the right side to Morgan Reilly who sidestepped a Bruin defender and rifled a shot that was answered by the glove of Tuukka Rask. The Bruins would respond after the good shift by Toronto with two strong, cycle-the-puck and physical shifts by the third and fourth lines – something that was much needed for Bruce Cassidy’s bench as it wore down the Maple Leafs’ defense. After a few more chances for both teams, the period ended with two “almosts” for the Bruins, but the Black N’ Gold still took a 3-1 lead to the dressing room heading into the last period of regulation. Clinging to a two-goal lead entering the third period of play north of the border in Toronto, the Bruins needed to keep their foot on the gas in order to force a game 7 back in Boston at the Garden. After a slow start to the period for both teams, the Leafs began to put some pressure on the Bruins. John Tavares had a point-blank chance in front after a great pass from behind the cage and Rask pushed over to rob him. Right after the ensuing draw, a passing play for the Leafs found Auston Matthews wide open on the right wing side. He fired a wrist shot off the pipe and in that beat Tuukka Rask to the blocker side and the Leafs cut the deficit to one, 3-2. The Leafs then continued the pressure all period long, hemming the Bruins in deep almost the whole period. The Bruins held on with Rask having his best game of the series. The defense also stood tall with Brandon Carlo in particular playing like he did in the regular season, shutting down the Leafs and making fantastic plays in his own zone. Charlie McAvoy also had an incredible game as he played 9:19 of the third period, with Zdeno Chara logging 8:49 of ice-time himself. The Leafs pulled Andersen late in the third but Brad Marchand sealed the game for the Bruins with an empty-netter at 18:06 of the final frame, giving the B’s a 4-2 lead. With the big win, the Bruins have now forced a game seven back at TD Garden on Tuesday night for the third straight time in the playoffs against Toronto.